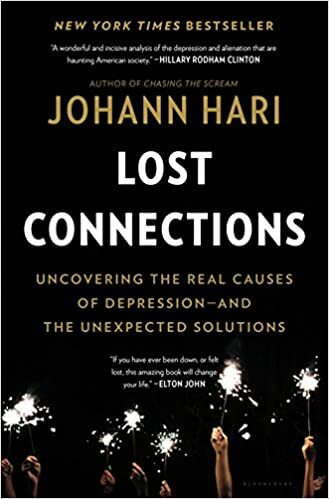 Lost Connections: Uncovering the Real Causes of Depression – and the Unexpected Solutions – loudlatinlaughing – Euge! Euge! I wanted this book to be as interesting as the interview the author gave to Ezra Klein (“Is modern society making us depressed?“). Unfortunately it falls short, Hari being a much better interview subject than writer. It’s not a complete waste of time, though, as it reinforces his message over hundreds of pages: society now makes us isolated and has us focused on the wrong values, which end up making us depressed. To solve this, don’t just pop an anti-depressant but dive to the root of the problem—connect with your neighbors, find meaningful work (e.g. bike shop co-op), practice loving kindness and meditation, stay off the internet and stop watching as much TV. Exercise, because we’re animals. Get out in nature. Universal basic income. You know, the usual proscription to solving modern ills.